Stamped concrete is considered as one of the most popular and versatile materials to use outdoors for your patios, sidewalks, decks and driveways. The main reason why many people decide to use stamped concrete for their Choctaw home is because it enables you to choose any design you like. In fact there is practically no limit to what you can design with stamped concrete. You can choose from a wide range of styles and designs, depending on your particular preferences. There is stamped concrete that looks just like brick, rock, and even slate. There are also others that are similar to tiles. Another popular type is the stamped concrete that looks like natural stone. This enables you to retain the same style of nearby surroundings, such as your home’s facade. You will also benefit from the fact that your stamped concrete will be unique. This is because no two projects can look exactly the same. When you decide to think about the different possibilities, we will be pleased to show you the wide range of stamped concrete variations that are available. The sky is the limit to what you can create with the stamped concrete of your choice. There are limitless opportunities to diversify with the colors, textures and imprints available. We will be pleased to assist you with some ideas, until you come up with the design that will be your favorite. Apart from allowing you to be as imaginative and as flexible as you wish, stamped concrete also has the advantage of being very durable. 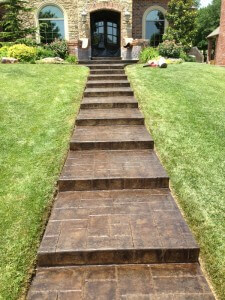 When you decide to use stamped concrete you can put your mind at rest that this is a long-term investment. Concrete is durable in any type of environment and can hold up well to traffic, wear and tear. Moreover, it does not require too much maintenance when compared to other types of materials that are used for outdoor projects. 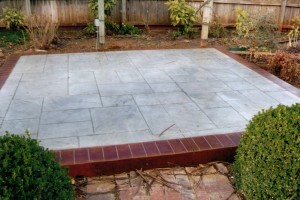 When you trust the stamped concrete project in capable hands, such as Bill’s Custom Concrete, you can put your mind at rest that the job will be carried out in a professional way that will not cause you any problems in the future. The concrete will be poured evenly as otherwise the stamping will not turn out as designed. We will use your specified colors and every detail will be taken care of because we strive to create a uniquely appealing project that will truly take your breath away. We also place a lot of importance on the placement of the expansion joints while laying the concrete. This is done so as to avoid any cracks once the concrete starts to expand and contract with the extreme Oklahoma weather. We plan it all out in advance to make sure that we still maintain the pattern you ordered because ultimately your total satisfaction is our goal. Stamped concrete will not only offer you the opportunity to be creative and unique, but it will also increase the resale value of your property as it is aesthetically pleasing. We believe that choosing to use stamped concrete for your next project at your Choctaw home is a great way to diversify your property and make it truly unique. We will install the best stamped concrete design and give you an unlimited number of choices to make your home all it was meant to be. Please call us today at (405)755-3975 to set up a time to discuss the endless possibilities you have with stamped concrete.